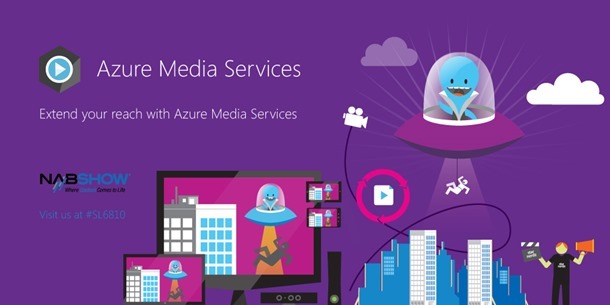 It’s been a busy year for Azure Media Services (AMS). Over the last 12 months, we’ve launched a an Olympic-scale live streaming platform, expanded our content protection offerings, introduced a cross-platform Azure Media Player, enhanced our core Media Services features, broadened our footprint to multiple new geographies including India, South America and Australia, and achieved multiple industry recognized compliance certifications. These have led to customer wins that span the globe and includes RTL Netherlands, Avex Group, TVN Poland, Veritone, Oceaneering, and Clickview. Today at the National Association of Broadcasters (NAB) Show 2016 in Las Vegas, we are announcing a groundbreaking new Media Analytics suite, support for Apple FairPlay Streaming and 360° video streaming, as well as MPAA and FACT certifications. In addition, we’re announcing new and expanded industry partnerships with Imagine Communications, Veritone, Signiant and VSN. Last week our team announced the public preview of Azure Media Analytics, a collection of eight speech and vision services that are enterprise ready, compliant, secure and offer global reach. Azure Media Analytics brings key new capabilities like motion detection, speech transcription, deep indexed video search, content moderation and more to the video domain. These capabilities have applications in a variety of industries including public safety, government, surveillance, retail, education, automotive, and more. Media Analytics is a key addition to the family of services that are offered under Azure Media Services umbrella. You can learn more about it in the detailed blog post and can also try it out here. This week at NAB, we’re also announcing the public preview of FairPlay Streaming support in the Azure Media Services platform. Apple FairPlay Streaming makes it possible to securely stream premium content using the HTTP Live Streaming (HLS) protocol. By implementing FairPlay Streaming natively in Azure Media Services, we now enable you to easily encrypt video, exchange keys, and securely play back content optimally on iOS, Apple TV, and OS X devices. With integrated support for FairPlay Streaming, PlayReady and Widevine, Azure Media Services provides a complete multi-DRM cloud solution for streaming VOD and Live content, enabling our customers to use the most optimal protocols to reach their audiences on the widest range of today’s popular devices. Video Editor Plug-in is an add-on for Azure Media Player that simplifies the task of clipping and trimming video streams. Azure Media Services previously supported the ability to generate sub-clips of existing videos, but that process could be difficult and imprecise without having good tools for capturing the perfect window of footage from a longer video stream. For example, picking the exact frame when a scene changes can be painstaking and time consuming, and that task gets increasingly more complex with a live stream. Many customers have also told us they that they needed a tool that integrates with their existing workflows, whether that was a full blown video content management system (VCMS) or a simple in-house asset listing page. For more information, please check out the Video Editor Plug-in post on the Azure blog. With the successful launch of the live streaming and encoding platform, we have seen a wide range of use cases and scenarios being built out by our customers and partners. A recent hot topic on our forums and in our inboxes here on the Azure Media Services team has been 360° virtual reality streaming. As the ecosystem for VR streaming develops, vendors are beginning to specialize in this area by providing products ranging from head gear (Samsung and Facebook), to cameras (GoPro) and software (VideoStitch). To further this ecosystem, we are pleased to announce our partnership with Videostitch to enable you to create your own 360 live video streams from Azure Media Services. Learn how you can create your own 360° live video streams using Azure Media Services and Vahana VR from VideoStitch. In March 2016, Microsoft Azure became the first hyper-scale, multi-tenant cloud provider to successfully complete a formal assessment by the Motion Pictures Association of America (MPAA) that addresses all three of their Content Security Best Practices frameworks: Common, Application, and Cloud Security Guidelines. Today, we are excited to announce the additional achievement of Federation Against Copyright Theft (FACT) certification, which provides an additional level of security assurance to premium content owners who wish to leverage the Azure cloud platform. Common Media Application Format (CMAF) is a media streaming format jointly led by Microsoft and Apple to streamline internet video delivery, has received wide industry support and has been submitted to MPEG for standardization. CMAF is based on industry convergence from technology that evolved from Apple QuickTime and Microsoft Smooth Streaming that has been widely adopted in combination with MPEG DASH streaming (Dynamic Adaptive Streaming over HTTP). It is supported in all major HTML5 Web browsers. CMAF include MPEG Common Encryption for secure playback with all major DRM systems and will enable a single encoding of premium video, such as a movie or TV show, to be securely streamed to any device with Internet access. Networks will benefit from efficient caching and routing of the same media segments over HTTP, broadcast, and multicast networks, regardless of consumption device. On the partnership front we are excited to announce new and expanded partnerships with Imagine Communications, Veritone, Signiant, and VSN. Azure Media Services customers now have instant access to market-leading playout, encoding and dynamic ad insertion technology from an efficient, centralized, and virtualized workflow environment made available through Microsoft Azure. Imagine Communications, empowering the media and entertainment industry through transformative innovation, announced that its market-leading playout, live encoding and dynamic ad insertion solutions are now available in Microsoft Azure. In addition to providing new monetization opportunities for broadcasters, video service providers and other media companies, this suite of solutions enables customers to dramatically improve the speed, efficiency and flexibility of media workflow operations by providing secure, scalable, and on-demand access via Azure. The collaboration between these two leaders in the media and technology industries represents the most ambitious action to date to provide broadcast-quality video origination and distribution capabilities in the public cloud. The complete list of Imagine Communications solutions can be found here in Azure Marketplace and are ready for immediate deployment. Veritone, which provides cognitive media solutions aimed toward developing intelligent cloud solutions, has built and deployed near-real time intelligence solutions for broadcasters, advertisers, media firms and other enterprises via its Cognitive Media Platform. As an early adopter of best in breed "cognitive engines", Veritone has already seen tangible business benefit from incorporating Microsoft's Media Indexer service onto its platform. Now part of Azure Media Analytics, Media Indexer has helped Veritone to quickly analyze and transcribe audio and video content in multiple languages for its customers securely and efficiently at scale. Signiant announced the availability of a pre-built workflow that provides tight integration with the AMS platform. The automated workflow uses Signiant acceleration technology to transport content files quickly and securely from on-premises storage into Microsoft Azure, where AMS retrieves and processes the assets. The finished content is then returned to an on-premises location via Signiant. The Signiant workflow delivers media assets to Azure, along with an optional Premium or Standard transcoding profile. Signiant monitors the progress of the transcode within AMS, reporting progress or error messages to the customer. The workflow can also be configured to delete processed assets from AMS once they have been successfully downloaded. The workflow combines both Signiant M+A and Azure’s scalability to allow multiple transcoding jobs to be handled concurrently. Visit signiant.com for more information. VSN’s Media Asset Management suite with advanced features for Broadcast, Media and Entertainment is now fully integrated with Azure Media Services, creating an enhanced MAM on Cloud solution that addresses the most demanding needs of media companies. VSN confirms its trust in Microsoft Azure as its preferred Cloud partner. With Azure integration, VSN’s users can now access an enhanced Video on Demand (VoD) or Live Streaming platform without bandwidth constraints, incorporating MPEG-DASH support, multi-device and DRM management, protection and encryption provided by AES, PlayReady, Widevine and FairPlay Streaming. This integration also enables advanced automatic cataloguing features that take media management to the next level of efficiency. This integration will be presented at the NAB Show 2016 at VSN’s stand, SL8006. Stay tuned for more Azure Media blog posts that will dive deeper into these announcements. Learn more about Azure Media Services, and visit us at our NAB Booth SL 6810 to meet the Azure Media Services team and see these services in action. For official documentation and discussion of new features on Azure Media Services, please check out our documentation. If you have questions about Azure Media Services, please use one of these two official community forums listed below or visit our page on Azure.com to get your technical questions answered.